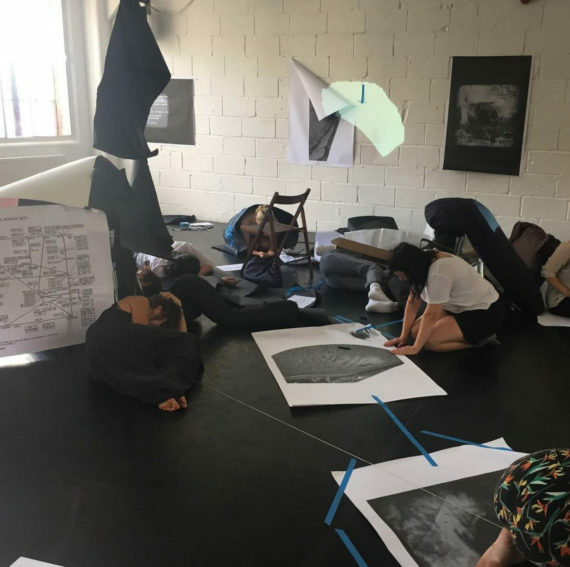 This summer I was invited by artist Flora Parrott and geographer Harriet Hawkins to speak at Expand & Contract, a research day they organised in London. The conference hosted a group of multidisciplinary practitioners to expand on themes related to Flora’s PhD on perception and the subterranean. It included a lecture by archaeologist Clive Gamble about his findings related to our early ancestors, a shamanic drum journey to our inner caves led by academic William Rowlandson, a talk by Loretta von der Tann from Think Deep about the challenges of working in underground engineering and an atmospheric underground audio journey with SHELL LIKE. My contribution to the day was to run a mini version of Katabasis, a LARP I have co-designed which is set in a cave. Using Flora’s artworks as a sort of stage set, the LARP became a way to physically process what we had experienced that day and to collectively imagine and create an underground space based on what we had to hand. I also held a lecture about the links between Cavers and Coders and as this research forms the starting point for this project I thought I would start my blog posts with sharing some of it here. 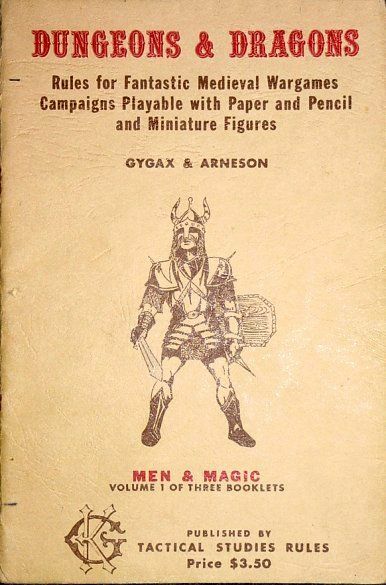 The relationship between gaming and the subterranean has existed since roleplaying game Dungeons & Dragons entered the popular imagination in the early 70s. Although it has been a popular backdrop in fantastical fiction (think Jules Verne’s 1864 story Journey to the Centre of the Earth or Ludvig Holberg’s even earlier 1741 novel Niels Klim’s Underground Journey) there is no direct explanation for why the subterrestrial has made such a mark on modern gaming lore. One reason could be that the cave – or dungeon – provides a helpful spatial limitation to guide players through a game, as you have only a limited number of options of where to turn next. The underground also provides ample narrative potential, with its association to the beginnings of human existence, as a place of resistance and subversion and as a still unknown and unexplored territory. I’ll begin with the absolute basics. Roleplaying games (RPGs) such as D&D are played with paper, pencils and plenty of dice. They are usually played in a group, led by a “Dungeon Master”, who has either written the game or prepared a pre-existing campaign and who is there to guide the other players through their quest. What RPGs do particularly well is encourage players to be active and use their imagination to spur on the game – without player input there essentially is no game. The game narrative is spoken out loud and the only visuals present, at least in old school games, are the notes and maps players jot down themselves – unless your Dungeon Master is also a gifted illustrator, as my group’s DM is, who makes amazingly evocative drawings of the friends and foes you meet along the way. As video games have become more sophisticated in content and more expansive in playable space they are starting to feel more like old school RPGs in terms of their imaginary potential. That being said, in most current video games the possibilities the players have at their disposal still need to be pre-programmed into the game architecture, causing limitation by design. The first computer games were text-based adventures, also called interactive fiction, and essentially digital renditions of the Choose Your Own Adventure book format. They are typically played by one person typing text commands to a computer-controlled Dungeon Master, whose narrative unfolds through text on the screen. When typing in commands, the player has to hope the computer recognises their commands, basically like a primitive Siri or Alexa. Rather than using arrow keys to move around, a player might type in the compass directions or click on hyperlinks to advance the story, helped along by commands such as “get object”, “open door”, “enthrall dragon” or whatever seems appropriate. 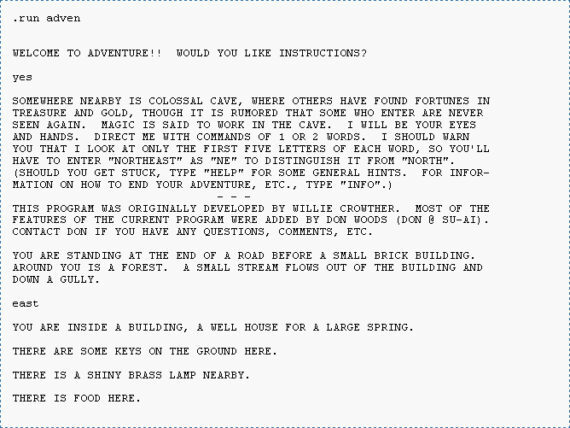 One of the first computer games to see the light of day was a text-based game called Colossal Cave Adventure. This was initially developed by a computer programmer called Willie Crowther in the mid 70s. Willie was an avid spelunker and based the game on an underground space he knew well, Mammoth Caves in Kentucky. In fact, a couple of years before he programmed Colossal Cave Adventure, Willie and his wife Pat were instrumental in mapping out and joining up the underground networks that constitute the Mammoth Cave system. 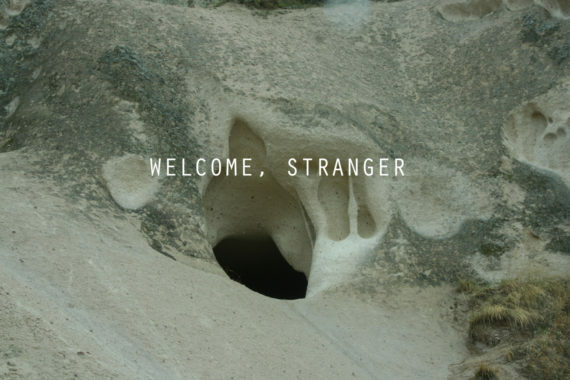 It is now known as the world’s longest cave system, with more than 400 miles (643 km) explored. 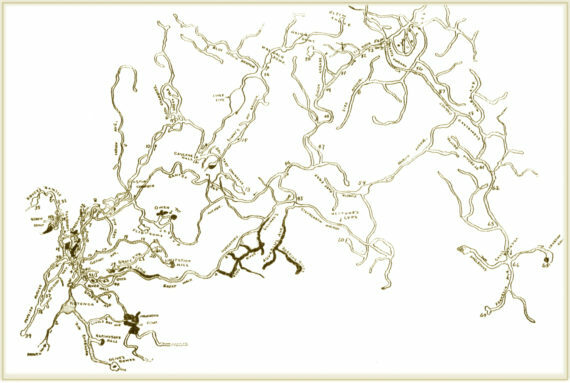 In the computer game the underground network is made of 3000 lines of code and 1800 lines of data, which includes 140 map locations and 53 objects to find along the way. Given Crowther’s interest in converting physical networks into digital spaces it is perhaps not surprising to learn that he was part of the team that developed the ARPANET, a computer network which linked various research nodes across America and Europe and which was a forerunner to the modern day internet. 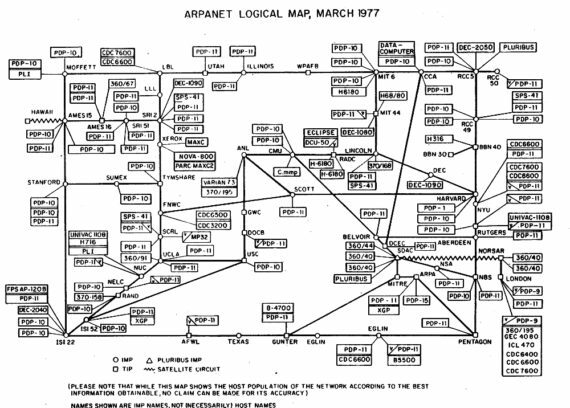 The ARPANET map holds an uncanny resemblance to an old school dungeon map. As with RPGs, text-based gamers often keep track of their progress, often through drawing. A wrong turn in Colossal Cave Adventure could mean death by hot flowing lava, or worse, being stuck in the Hallway of Endless Mist. As you can imagine, the save function wasn’t great. I find the visual links between the mapping of a computer network and a cave network, whether real or imaginary, really striking. It has also made me want to explore further links between communication technology and caving, of which I am sure there are many. 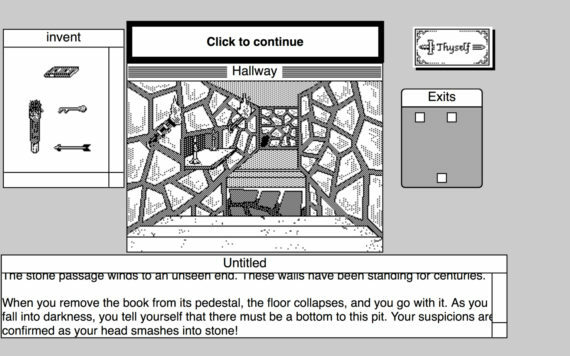 With computer technology improving in the 80s, text-based adventure games developed into first-person dungeon crawls, whose graphics still had to be crude enough to fit onto a floppy disk. The dungeon seemed a good setting as its repetitional layout was conducive to the aesthetics possible with the technology of the day. Many of the characteristics of computer-based dungeon crawls were lifted from the tabletop RPG format. This included the inventory of objects that players could carry with them, as well as the dungeon map visual that would track what areas were explored so far in the game. In terms of gaming history it is worth mentioning that it is fourty years ago this month that Richard Bartle, inspired by Colossal Cave Adventure, linked up the first ever MUD – Multi-User Dungeon, on the University of Essex’s computer network JANET. This came closer than ever to a screen-based and communal RPG-like experience, as it could connect players in different locations to play out a scenario. It is also the precursor to the MMOs (Massive Multiplayer online game) we know today, such as World of Warcraft. I’ll end it in the pixelated 80s for now however. 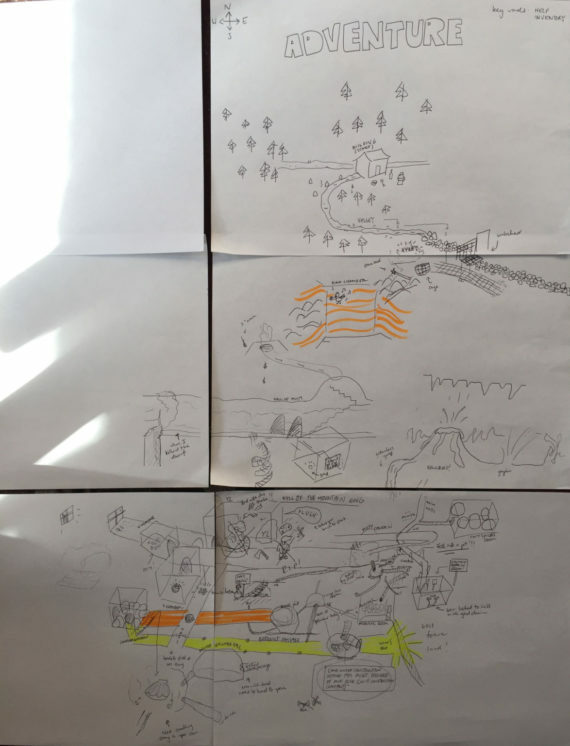 My next post will hopefully be about my attempt to map out an underground structure through a games software designed to make text-based adventures, as a first step towards creating a virtual environment.